Fully Charged, the popular YouTube channel hosted by British actor and electric car advocate Robert Llewellyn, reached the next level last weekend as it turned into a live exhibition at Silverstone, UK’s famous F1 track. Thousands – including me – flocked to the brand new EV and renewable energy show, to witness the launch edition of what promises to be a very successful franchise in the years to come. *This article originally appeared on opportunity:energy. Author Carlo Ombello graciously shared it with InsideEVs. Despite their best plans for an early trip, visitors hoping to smoothly make their way to the Silverstone circuit by opening time were greeted by a massive queue starting all the way from the motorway exit, sure enough caused by the event and probably featuring the highest percentage of electric cars of any queue in British motor history to date (perhaps worth checking with Guinness?). An incredible testament to the enthusiasm surrounding the event. The show was hosted at Silverstone Wing, right by the Formula 1 track, where some 60 exhibitors packed three halls with green technology from smart energy devices to batteries, from vehicle-to-grid chargers to solar panels. Over 50 electrified vehicles were also available to visitors, spread out between the halls, the pit garage and the paddock, with unique gems such as the famous Tesla Model S Shooting Brake and many more one-off classic car conversions as well as standard electric models. A special place in my Italian heart was taken by the 1965 Fiat 500 electric conversion, a stunning 21 kWh capacity, ‎2.97 m (116.9 in) long little EV which uses Tesla modules jammed at the back and front of the car and easily puts to shame Fiat Chrysler’s feeble electrification efforts to date. To put it in context, the much bigger – 3.62 m (142.4 in) long – 2017 Fiat 500e currently on sale in California “boasts” a 24 kWh battery yet CEO Marchionne still can’t do better and loves to claim he is selling it at a loss. Perhaps he should give a call to Elon Musk and get a quote. All the latest EVs on the market made it to Fully Charged Live, with the new Jaguar I-Pace polarising the attention in one of its first public appearances as a production model, together with all major brands such as Nissan, Kia, Hyundai, VW and a massive display by Tesla, probably the most represented brand thanks to an official corporate presence (cars and energy) and a wide group of enthusiastic owners. While no test drives were available to the public, private Tesla owners generously offered free local shuttle service to and from the Silverstone Wing building throughout the weekend. As Fully Charged followers would have hoped, the core of the event revolved around compelling live sessions hosted by either Robert Llewellyn or Fully charged co-host Johnny Smith, interviewing leading representatives from disruptive companies in the field of sustainable energy. A total of 16 sessions were programmed over two theatre spaces in the halls, guaranteeing a constant stream of live events. This format attracted visitors in droves as each live event was jam-packed beyond capacity, testifying the insatiable thirst of the public for the latest news on all things sustainable. It was a very intense and successful weekend for the Fully Charged crew. They did a fantastic job and welcomed over 6,000 visitors with only few months planning and no marketing. No doubt the focus will now shift to the next seasons, as the scope for expanding the reach of Fully Charged Live is almost boundless. We could soon expect this to become a globe-trotting, semi-annual event covering all aspects of sustainable living from cars to energy and even food. Larger venues are on order and, by popular demand, maybe we could hope for proper EV test drives at the next show. Many people are already looking forward to more. 2 Comments on "Fully Charged Live Rocks Silverstone"
Looked like a great event! Wish I could have gone. Indeed it was great. The only shame… with all those visitors they may have needed a bigger venue! Amazing launch for something so new. I like it that Robert Llewellyn is actually there leading the show, must have been very tiring! My bet is that had it been hosted in London or other big UK city they could have got more visitors. 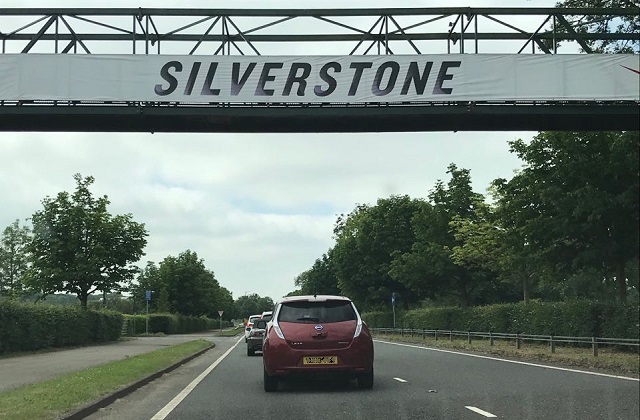 While it’s true that many loved driving there with their EVs, Silverstone is still over an hour from London and other cities. It will make sense to use it again if they plan proper EV test drives. I particularly enjoyed the paddock as it was all about electric cars, while the halls were filled with green tech exhibitors, like in many renewable energy fairs all over the world. I think they will start planning events at multiple location for next year, Fully Charged is very popular abroad.